We're back with a very special treat - something we've all been waiting for - new photos of the simply beautiful Princess Charlotte. 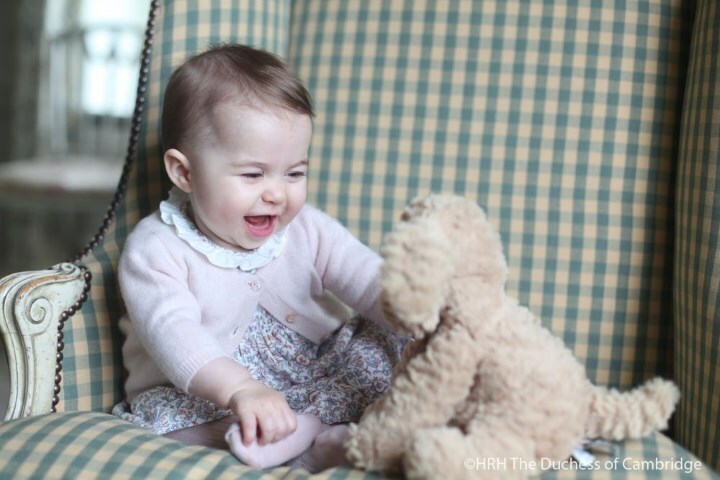 Kensington Palace released two new photos of six-month-old Charlotte taken by Kate in early November. The Palace said: "The Duke and Duchess hope everyone enjoys these new photos of Princess Charlotte as much as they do." 'In the first picture released, Charlotte is seen to now have a full head of hair as she sits in an armchair with her toy. She howls with laughter as her mother snaps away with the camera - believed to be the same Canon EOS 5D Mark II she used for previous shots of her children. We had been eagerly anticipated new photos of Charlotte for some time now and we certainly were not disappointed. They are very natural, informal shots and capture an insight into the little princess's personality. The portraits very much follow the relaxed style of official photos the Duke and Duchess have released of their children thus far. I can see many family resemblances, from similarities to the Queen as a child, to Carole Middleton, and of course Kate. She has inherited her father's blue eyes and her mother's dark hair. Who do you think Charlotte resembles? Identifying Princess Charlotte's outfit proved quite a challenge. With thanks to an Anonymous commenter and Hello! Magazine for discovering the £21 dress is by Spanish brand M & H. It is thought the piece was a gift from Nanny Maria Teresa. 'It is thought that Charlotte and Prince George's Spanish nanny, Maria Teresa Turrion Borrallo, bought the dress in the city of Valladolid, in northwestern Spain. 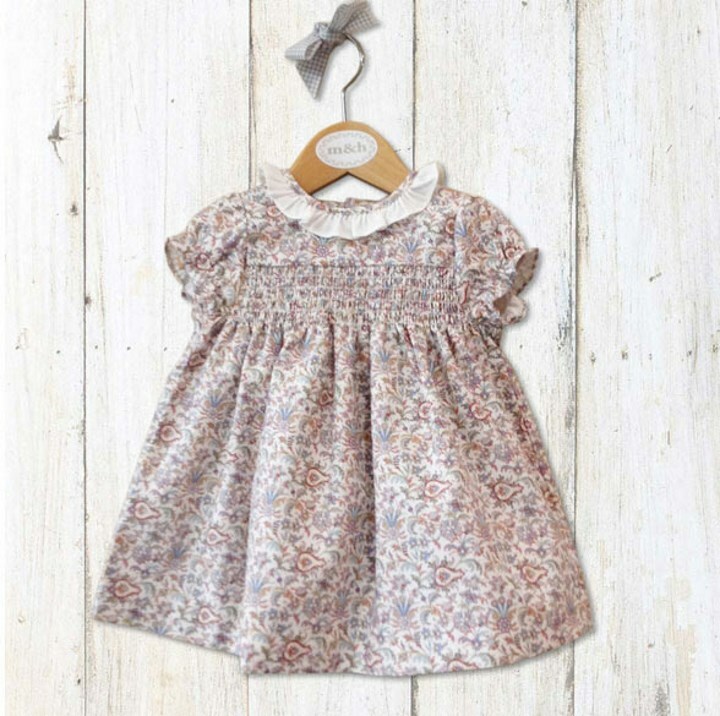 Several customers from the nearby town of Palencia travel to Valladolid to visit the store, and as royal nanny Maria hails from Palencia, it is thought that she bought the dress for baby Charlotte. Amaia Kids confirmed Charlotte's tights are theirs. The £11 tights are described: "Little legs will not only be kept warm but will also look pretty in these lovely stretch ribbed knit tights." The toy dog Charlotte was playing with is the Jellycat Fuddlewuddle Puppy. The super soft toy retails for £17 at John Lewis. Of course, it feels like quite some time since William and Kate introduced their daughter to the world on the steps of St. Mary's on 2 May. 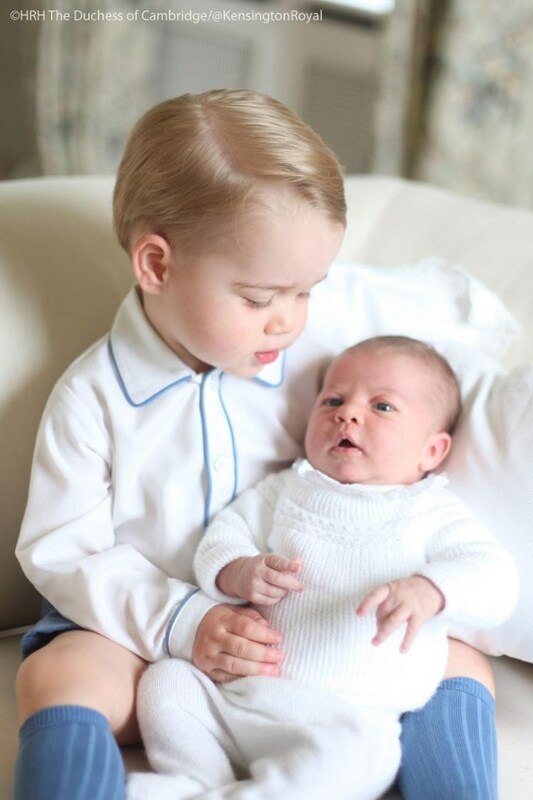 In June, the couple released portraits of George and Charlotte taken when the princess was around two weeks old. There are many similarities to today's photos; again they were taken by Kate, a keen photographer, at their Norfolk home Anmer Hall. Kate captures beautiful shots of her children in a very relaxed setting, and who could they feel more comfortable with behind the camera than their mother? We last saw the princess on the day of her christening - 5 July at the Church of St Mary Magdalene on the Sandringham Estate. Charlotte has grown so much since then, with dad William describing her as "a joy of heaven" and "ladylike". As of writing, no new photos have been released of Prince George. It has been suggested another portrait featuring George and Charlotte might be released closer to Christmas or perhaps we'll see George on Christmas Day. I'll update the post if there is any further news on this. Also today, a word on Kate-related 'Cyber Monday' sales for those hoping to partake of the abundance of sales on offer. 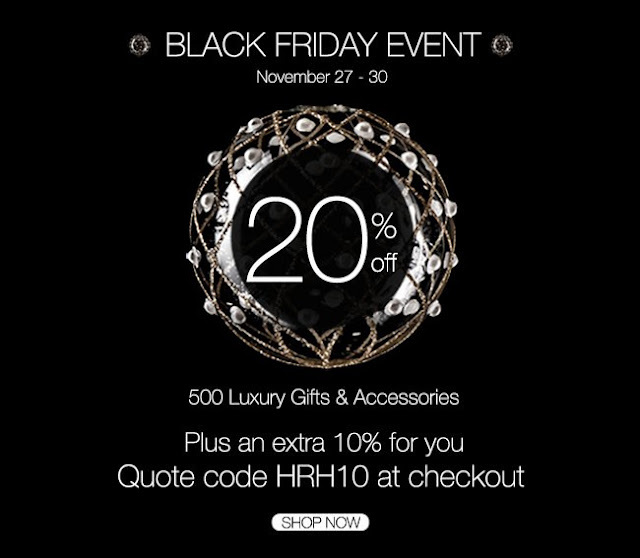 At luxury accessories brand Black.co.uk they are still offering 20% off plus an additional 10% discount with the code HRH10. Links of London are offering 25% off with the promo code LINKSBF25. 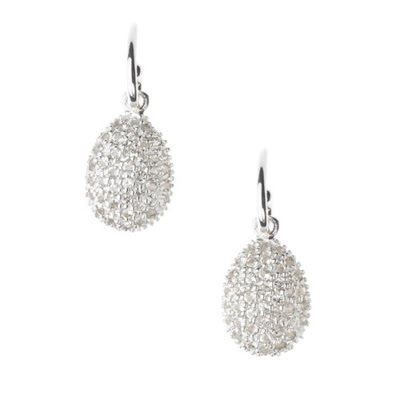 One item from the brand which may be of particular interest to Kate fans is the Hope Egg Earrings, as worn by Kate in her engagement portraits. There's 15% reduced at Hobbs London. It's 20% off all orders at Bobbi Brown. Bloomingdales are offering up to 25% off selected items for their sale. 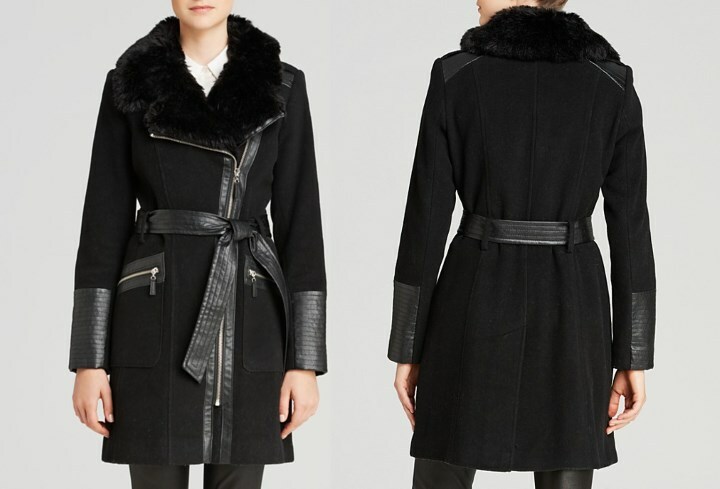 The popular Via Spiga coat Repli-Kate is discounted from $354 to $212. 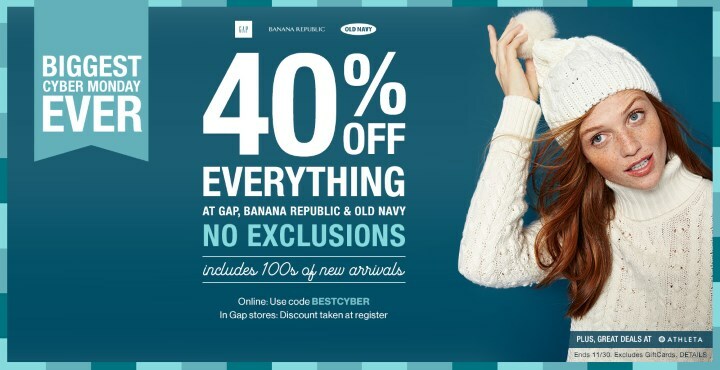 There's 40% off everything at GAP with the discount code BESTCYBER. 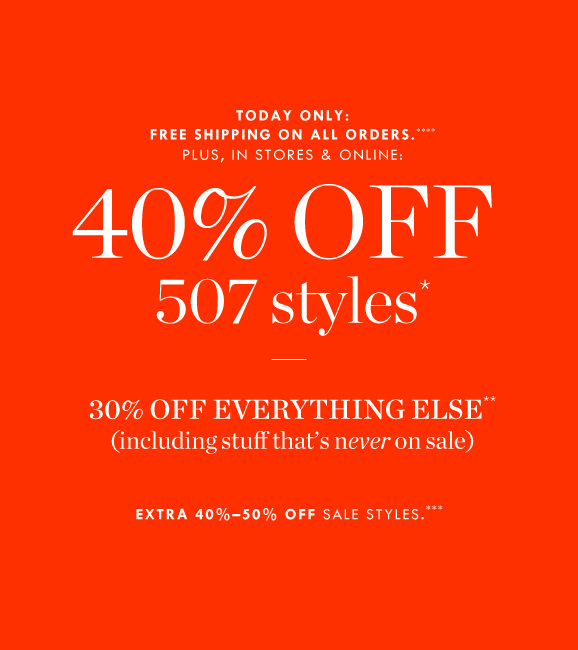 There's also up to 40% off at J Crew. 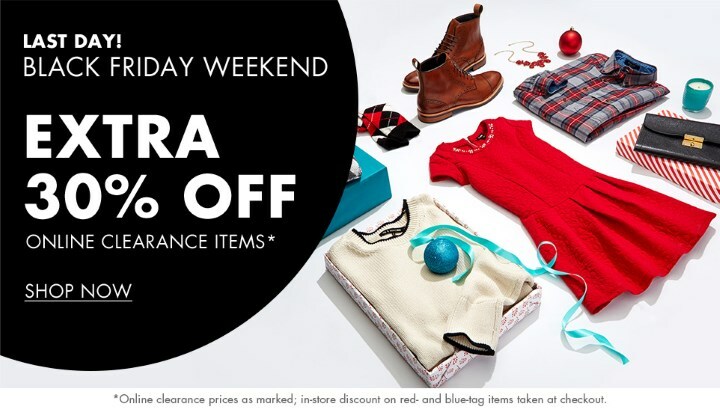 Take an extra 30% off clearance items at Nordstrom Rack. And last but not least there are excellent markdowns at Stuart Weitzman with Kate's Corkswoon wedges reduced from $398 to $279 and Kate's Minx Wedges discounted from $425 to $298. With thanks to the lovely Susan from WKW for the tip! Darling photos! Charlotte looks a lot like her brother. Wow, when they popped up on twitter it was really out of the blue! She looks so darling! A nice mix of both parents (and other relatives), just like George. But surprisingly she doesn't look much like George. I love her brown hair with the blue eyes! Also must add that, from what little we have seen, I think I love their decorating style!! I was a bit surprised that it was just Charlotte. Were these to celebrate her being 6 months? And if that's the case.. can we expect more pictures before christmas?! :O Either way, very nice to see these pictures. I love her smile! I completely agree. Charlotte is beautiful, especially her eyes. I also thought I would love to see their home, it appears to be beautifully decorated. No surprise, as Kate seems to have impeccable taste. I was wondering the same thing, because if they were Christmas photos I think they would have included George and waited to release them so that it's closer to Christmas and to not upstage Harry (though I really doubt that these pictures upstaged him in any major way.) But by releasing them now, they can still release a separate set of photos for Christmas that include George. Though I will admit that I am a little bit surprised that they released these photos as its really not close to a major event or holiday. Which makes me wonder if this is a new strategy for the Cambridges. In that by releasing more pictures theyll dampen the demand for pap pictures. This basic argument has been around for so long and maybe since there have been about one set of pap pictures of George per month, they've decided to give this strategy a go. They didn't exactly pop up out of the blue, the media know about them ahead of time and they were embargoed until a certain time this morning. I'm sure it's because she is six months old. I'm a little surprised at this week because Charles is at the climate change conference and Harry is in Africa (delightful articles about him.) I believe it shows there is really no concern about drawing attention away from other royal events as has been speculated about in the past. Although it was on a day when they were not doing anything. It was on Harrys day of for example. So I think a little thought is put into it, like they didn't release them when he was opening the center or Charles was having the keynote speech. And to add to Rebecca's 17:31 comment, I believe Saturday was the last day of the Queen's tour of Malta. These were to mark Princess Charlotte's 6th month... my guess is we will get Cambridge Family Christmas photos sometime in the next few weeks. I'm pretty sure that's a dog, not a lamb! But utterly adorable either way. I love the pictures. I think it is 2 new photos and not four unless I missed something. It appears to me that there are two new photos and a side by side facial close up of the two new photos. Either way, I am glad to see these photos. Anonymous 321. She looks so much like the Queen!!! Adorable. I do see A resemblance to the Queen, very much so. Thank you, Charlotte. What a lovely surprise on a cold Sunday morning. I think Charlotte looks very much like HM in the first photo, especially around the mouth and chin. I think she resembles George a little more in the second photo when she is giggling at her little lamb. What a beautiful child. I hope we'll have more photo of the siblings together for Christmas. Oh my, what a treat! She is adorable! More like here mom IMHO. Great photos of Charlotte, relaxed and informal taken by Catherine, which i think is a brilliant and personal way of capturing them so young without the formality of an official photographer. I can't decide whether she's more like William (especially around the mouth) but with Kates's dark hair. It's probably still early to tell! Love the soft toy shot. Looking forward to the pair of them in a cheeky pose for Christmas! Charlotte is beautiful as is her outfit. I love these photos! I hope kate continues to release her own photos, as so far they are my favorites! The newborn sibling shots and now these are lovely. Was disappointed with the christening ones. I agree. Kate takes beautiful pictures! They are my favourites as well, even if they weren't taken by her. And that they are adds an extra level of cuteness too it. I really like her photographs! Kate's photos are by far a lot better that the christening ones, which I really did not appreciate ! Charlotte is a real beauty, she seems to have taken from her mother for the smile and the hair , and I wonder if , when growing up, she will not have dark blue eyes, which would be totally amazing with dark hair ! she has a more open face than Georges at the same age . really happy to see this little lady ! I was kind of strongly hoping she might be the spitting image of Diana while, at the same time hoping she wouldn't be as what a burden that might have created. I am at the same time disappointed yet glad she isn't. How different it can be. I was strongly hoping she wouldn't look anything like Diana at all. For her sake. I certainly wouldn't object to a strong resemblance but, even more importantly, Diana's influence will always will be present in her life. She definitely has her daddy's eyes!!! She looks not unlike the Queen at that age. She's beautiful! I think she resembles her Uncle Harry! Look at pictures of Prince Harry as a baby, and compare. I think it's a spitting image, except for the ginger hair of course! Hummm, Prince Harry, the Queen Mum, Valerie Middleton. I think she very much resembles all three. Thank you as usual for being so quick Charlotte! I saw them on a newsfeed and thought "Oh I wonder if our Charlotte has posted them?" And you HAD! Looking forward to more. I think the Cambridges are being very canny--releasing photos on their own cue but with such sweetness (Kate taking the photos) that they win over some of us who are quite sick of the cult of celebrity. I think that William and Kate understand that the public wants to see them but they are also choosing their own pathway to do it. I think they are doing much to avoid "the cult of celebrity" as you so aptly put it Valerie. I think that has been their goal since day one. A fine line to walk for sure and they are managing it just fine. Gorgeous ! Adorable ! Loved the photos. Wish we could see how they decorated their house. Looks so British and sweet ! the decoration looks like Nordic Style furniture .... I am not surprised by Kate's choice, it's classy and light at the same time ! Must be rather old nordic style if that's the case. Like.. my grandmothers cottage furniture :) Because modern, nordic interior design is very, very rough and hard lines. Alot of untreated wood and concrete. It reminds me of Scandanavian style as well Nicole. I have a similar chair from my Swedish grandmother. yep. French country with hobnail accents. Would so love a tour of their two homes. Here I am Royalfan, I appreciate the mention but my expertise here (as elsewhere) is quite limited. For what it is worth, it seemed old-time Swedish to me too - I remember a group dinner in Stockholm at a grand house that was done in that cream and blue, and another place - an old palace, I think, in Copenhagen that was done in pale green and cream - lovely - but I'm thinking from what Rebecca has said, Swedish style may have moved on to a less formal, more natural and rustic look. Most probably Royalfan is right and it is meant to look French country. I don't think of those pale tones being traditionally English - it's a little too contrived for that - though of course everything goes these days. I'm wondering if it is the master bedroom or possibly a sitting room - it would look very high maintenance to be a nursery. With muddy little spaniels with muddier paws everywhere, I can't imagine that look in our house Lupo must be throughly scrubbed before he's allowed in. It's delightful though, and photographs so well. The room I love the most is the drawing room at Clarence House - as all know, I'm not a Camilla supporter but she and/or Charles and their decorator did come up with something most elegant - grand and yet still comfortable looking. But not at all suited for dogs - the Jack Russells must stay elsewhere. Julia, it seems that we agree on the occupants of CH and the home itself. :) I liked it very much. It's formal, but warm and I do not believe they changed much since the QM was alive. 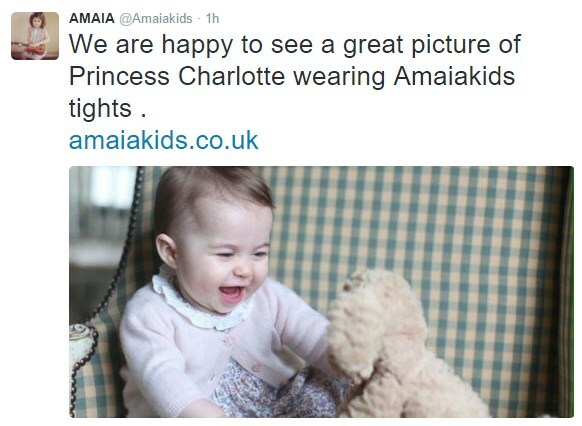 I am delighted to see two pictures of Princess Charlotte! To me, she looks like Granny Carole... But I see the Queen! She has her own look, with her dark hair, creamy complexion and beautiful blue eyes! The blue eyes are a tribute to her late grandmother, Princess Diana. Thank you for your post!! I am a Royal follower and a loyal reader of your blog!! Happy Christmas! It is all genetics of course but we often do say it's a tribute to some past family member when someone resembles them - when people say how my eyes resemble my dear late mum''s I really appreciate it. Just sign me Julia the sentimental from Leominster. Fair enough. I've just never heard a family resemblance referred to as a tribute before. It makes it c=sound deliberate, which of course it can't be. Wow she is just darling! She looks like a little doll. So gorgeous and her has quite the little personality shining through. Love the way she is dressed too, what a lovely surprise. I too think we'll get one for Christmas. But this was just lovely. Kate has a great eye. She does seem to have that intelligent, determined, focused look like George has. These two have quite a unique future in front of them. No doubt William and Kate will make sure they prepare them adequately for their destinies. Huge task. Great comments. Charlotte is a beauty and a cutie! Thank you, Charlotte, for a wonderful surprise post! Both Princess Charlotte and Prince George have such striking coloring, with Charlotte's blue eyes and dark hair, and George's brown eyes and blonde hair. :o) I think that the little princess looks a lot like her Granny Carole and the Queen. Thanks again for all your hard work on your fabulous blog, Charlotte! So cute!!! She looks exactly like her dad! Oh my, what a doll! She is absolutely beautiful! Kate captured some precious moments. My first thought when I saw the picture of Charlotte giggling was all the fun and giggling heard from her watching George run around and play. I loved seeing my children interact and play together at such a young age. Don't you know William and Kate are loving being parents! At first glance I see Carole Middleton, but the close up with her bright blue eyes reminds me of her daddy. :) She is so precious! Such a sweet blessing from God! These pictures are such a special surprise and I can't wait to see photos of George and Charlotte at Christmas! Beautiful to wake up to these pictures this morning! Beautiful baby, beautiful little girl dress, beautiful little pink sweater, beautiful chair and a beautiful photograph. I must say I had quite a deja vu looking at the photo of Princess Charlotte with her stuffie. I have a similar pboto of my daughter with exactly the same expression. Pulled at the heartstrings a little bit. They grow up too fast. For those saying they see the Queen, I agree. Althoug, I think PC's features are less extreme than the Queen"s were as a baby; a more muted version, if you will. I was wondering about a resemblance to the Queen Mother but I couldn't find a photograph of her as a baby. I found one of her at about three and its possible. I see a resemblance there too. How is Catherine, Erika? Believe it or not, I think about her and that awesome outfit she put together from time to time! fun with our dress Kate posts. She's hoping for another. Glad to hear it, Erika. Please tell her I'm very much looking forward to her next endeavor!!! Maybe your daughter can put together some outfits for baby Charlotte or do some mom daughter looks for Kate and her little girl. I will let her know :-) Thanks to both of you. OH those BLUE EYES!!! Oh she's just gorgeous!!! From the side she looks like George but from the front she has her own look! She's just, simply beautiful!! I will need to see pictures of the Queen to decide, because all I could see was Carole Middleton. Am I crazy? Then when I look at pictures of Kate as a adult, I see her. Okay, I am going to go look! It certainly looks very possible! How great if she's in a gift from Carole and last time she was in a gift from the nanny! A very sweet way for them to include people if that is the case :) Even those times we don't identify the link, the giver will know. That makes me wonder if some of George's outfits might have been gifts as well! And if true, I think it's a lovely way for Kate to include Carole in the process as the children's milestones are documented. I keep getting an error message. I've tried clicking on the purple link (yea! purple) and copying and pasting it, being careful to omit the dots you added. Several tries got me a page with scantily clad ladies. Would love to see the picture. I went to the link to look at the picture and agree that the dress looks right, but then pretty much all I could concentrate on was how incredibly creepy the reflection of the photographer was, taking a picture of Carole through that window. Ugh. Thank you, Hannah, that link works nicely. Wow! This girl looks like her name and more; a combination of Kate, some aura of Carole, a disposition of Queen Elizabeth and eyes of her father/Princess Diana. I have a niece who looks like many people in the family; I feel a little mesmerizing dizziness with nostalgia when I look at her. I nick named her literally translated as, "the joyful feast". By sheer coincidence, she is the best party planner and florist I know of on top of her other profession. Been feeling a little poorly lately and so I've missed making some comments I wanted to - but just wanted to say how much I loved your remarks on roasting the Thanksgiving turkey Anon 15. A delightful post - thank you for sharing. Thank you, Charlotte! I shall make myself a cup on the strengh of that. Nothing serious, just very tiresome, oarticularly at this busy season. I hope you will feel better soon. Check around in case some virus is going around. Sometimes, I don’t know if it is air borne, some of the population get flu like symptoms and it goes away. Take good care of yourself. Oh my gosh what a beautiful baby girl!!!!!!!! Thank you so much Charlotte! I wish I knew how to pull up a photo of Valerie Middleton and her twin sister. I think she looks like them. Almost identical. And, is that a little Windsor sitting in a Windsor chair? Another Kate "coincidence"? More photos of George and Charlotte together please, and including Lupo would be the icing on the cake. I think you might be right Erika, I do see a real strong resemblance to the Queen Mum too. Hummm, perhaps a combination of her looks and Valerie's? Is that type of chair really called a Windsor chair?! Such a Kate thing to do! I love it! The resemblance of these pictures to those of Princess Leonore's first birthday ones is so uncanny. I am surprised that you Rebecca did not see that ! It would be nice but that is definitely not a windsor chair. Windsor chairs are more typically what one might have at a kitchen or dining room table. Typically, they are wooden chairs with rounded backs made up of curved rods that fit into a wooden seat. I think it is called a Windsor Wingback chair. I don't think it's a Windsor chair. Reading Wikipedia: A Windsor chair is a chair built with a solid wooden seat into which the chair-back and legs are round-tenoned, or pushed into drilled holes, in contrast to standard chairs, where the back legs and the uprights of the back are continuous. I don't think it's a Windsor chair. Reading Wikipedia: A Windsor chair is a chair built with a solid wooden seat into which the chair-back and legs are round-tenoned, or pushed into drilled holes, in contrast to standard chairs, where the back legs and the uprights of the back are continuous. It looks more swedish 1700 style; the light color and the pattern, I mean. If you google "swedish 1700 chair" and "english 1700 chair" you will see what I mean. Paola, that is true, but they have upholstered versions also. I have two in our bedroom flanking the fireplace and our decorator called them Windsor Wingbacks. My chairs are upholstered. It is a Windsor Wingback chair, upholstered. I have been decorating homes for years and that is definitely what it is. Like another post said, Google Windsor Wingback Upholerstered chairs. And oh my does that little baby resemble her great-great granny the Queen Mum. Wonder if she will have her disposition also. So good of them to share the photos. I must defer to the interior decorators on this site as they obviously know better than I but I do have a question. What makes this chair a Windsor wingback? I found examples of contemporary Windsor wingbacks on several sites but none on antique sites. I found a history of European wingback chairs on several antique sites but they only mentiion Sheraton, Hepplewhite and Queen Anne as possible styles. Windsor wingback chairs might be an American distinction? Well, every time a thing to learn! If it's so, another message by Kate through the images, it's great. Let me see a further message in the chair: it's a Windsor style with swedish hues and pattern, a program for times to come about the choices of young royals. Windsor monarchy tradition, but with a touch of swedish monarchy style. Well spotted, Anonymous 29 November 2015 at 20:39! I've just had a look at Princess Leonore's 1st birthday photos; Kate's are reminiscent of them. Fascinating might be a better translation. Charlotte is not only cute, but fascinating as she recalls both sides of the family. Who ever cares less for Kate's family, now can't avoid liking those kids. George has some of Micheal M and Charlotte has some of Carole. They both have their father's side as well. Well done William and Kate, and the next one? Well count your blessings and be happy for the gift so far, so well stamped with both of your traits. Anon 15: Well said: I totally agreed. What a beautiful child, beautifully photographed. Thank you for your post, Charlotte. 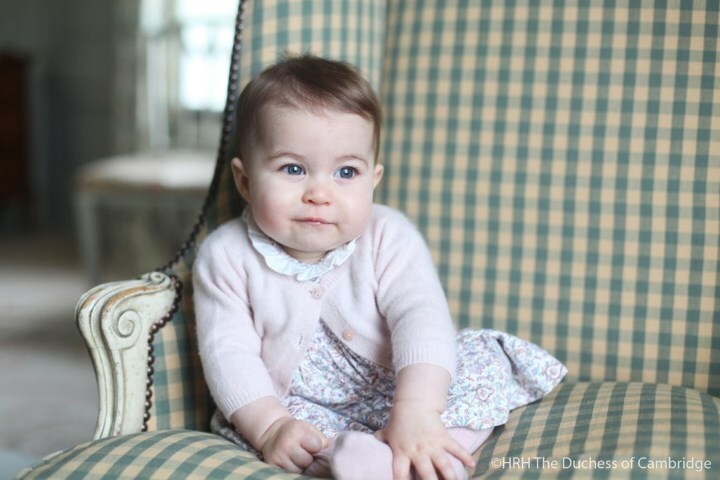 Thank you Charlotte for this post with the breathtaking pictures of Princess Charlotte. She is simply beautiful and looks to be a very happy baby. Kate is a very talented photographer. Would love to take a peek at her home and see how it is decorated. What a beautiful little Princess! To me she looks like her Granny Carol & HRH. I don't see HM but may a tinge of PW. Mostly I see HRH. Thank you Charlotte for updating your post. I think she looks almost exactly like the Queen Mum. Actually, I thought the same. I think she looks like the Queen mum. I think she has her eyes also. Beatrice looks like Queen Victoria, don't cha think? So intriguing how genetics work. I thinks she looks like the Queen mum, too. And I see Kate's brother in there, too. What an adorable mixture of both sides of the family. Glad they shared some pictures! Lovely photos of a beautiful little girl. The family resemblance is there, from both sides. Kate is a very talented photographer. Really precious. Charlotte is adorable and those eyes! Beautiful! And I agree, Tedi, I see a resemblance to both sides of the family. And it certainly looks like they have a warm and cozy home, based on the furniture/décor we have been able to see so far. Wow these pictures are an exact replica of Princess Leonore's first birthday pictures. Down to the antique chair and the stuffed toy. There were two of her and they are almost exactly like these two pictures. Hmmm... The setting for Leonore's photo is very formal compared to Charlotte's. Other than a child seated on a chair, I don't get the same feel at all to be honest . The chairs are almost identical don't you think ? Im with Royalfan on this one. these photos have in common a child seated on a chair and not even close to the same style chair. the feelings of these photos are very different. I think Charlotte does resemble george in some subtle ways. she is beautiful. will be fun to watch them grow up. She looks exactly like Carole Middleton. No offense, but I don't see Carole, Kate, William, Harry or Elizabeth in Charlotte. I, also, see the Queen Mum in Charlotte. Very much so. what a truely beatful baby and she has baby blue eyes i think she looks like kate and the queen with dads eyes i don't she looks anything like the middletons and OH that smile could melt your heart i think we will see christmas photos as well with both prince george and princess charlotte maybe even a shot with mum and dad this made my day!!! I can't simply believe it. I was so excited when I saw little Charlotte's photo, I hit the key board right away, and off went my comment. Now that I return to read, just found you commentary of this blog. I can't believe you find her similarity just about the way I did. That is a total almost identical two votes, without knowing each others comments. Then, that shall be the real similarity, entered on this day of November the 29, year 2015. It was voted and witnessed by the Blog's Ms./Mrs. Admin by the name Charlotte also, and by blog participant pen named, 15. My most memorable of the blogs here was Charlotte's birth and her parents possible trip to India. I can even boast and declare I knew the week she was conceived and said so on the dailymail.com on July 27/28, 2014. I could not believe when my prediction came true including that it will be a girl from that very July week. I am neither a witch nor a psychic, but here and there I receive gifts of enlightenment from the Divine in rare circumstances and people, and she is one of those. Even better, be careful of what I say. This web site has a photo of William and Kate at some outdoor sports competition in late July 2014. It is the same photo I am talking about which I happened to find here too in recent months. At that time, I hardly frequented this web site. In fact I started posting here in late 2014. The daily mail was my source for most things W &K until it felt like some frying pan to be a participant among all kinds of people when it came to William and Kate. It was as if some turned into monsters just to be negative about Kate especially. The couple’s over all action went like the following that July day. William was trying to “cool” Kate waiving his ID which he wore on his neck. Kate in her light blue sleeveless shirt looked sort of warm. It looked like “a different kind of warmness”. She had this encompassing glow, lively and yet “calms” and “cools” presence about her. I believe it was July 27-28/2014. I could not resist commenting unashamedly the following, “Kate seems to have an aura of pregnancy. She either got pregnant recently, or is in ovulation. She herself looks girly, and most likely might have a girl”. One of the commenters responded, “How can you say it will be a girl? You don’t know”, and went the story. Yes, I posted the above unashamedly and got it out of my chest. Should I not? After all, the thought came from some other force, and I was just the medium through the media. When the baby was born, the ME thought, I helped to bring this baby girl to the world because I gave the couple a clue and they most likely tried that week. Well, with all pure and good intentions/as in a fairy good human, no disrespectful offense here. Predicting her name correctly on this blog was easy. I played part an amateur astrologist, and part a numerologist. The former by finding at least two people on each side of the family whose names were Elizabeth, thus I concluded, the stars aligned/so reasoned, most likely the middle name should be Elizabeth. Diana is a “key word” in this history and it should ring like a bell at the end of the name, and thus Diana as the last of the name series/ I “rationalized”. Her first name, very much her own, but honor P. Charles/and to mean long awaited for. When it came to be the case, I predicted my own future may be in writing posters for advertisements. I also predicted her birth not necessarily to be late. If it was a boy to be by April 29, and if a girl, the latest by May 4th. I reached that conclusion by old folklore calculation, but here had been truth in it for many cases. How can you not love a baby that assists in processing the positive force? She is a cute baby who also recalls so many people of her dearest surroundings as well. She is my favorite. Didn’t I say be careful of what I say. For example, you are in Milan may be reading this, I am in US and our messages reach London. Yes, is it that simple? Nope. She doesn't look like Mary of Teck as a baby. She is so cute. Lovely outfit. I bet Kate is having a grand time finding clothing for her. I am reading a Phyrne Fisher novel set in 1928 Melbourne, (Kerry Greenwood) in which a magazine editor tartly states they will print no celebrity news beyond the report that little Princess Elizabeth has learned to curtsey, so I am bound to say she looks just like the Queen. 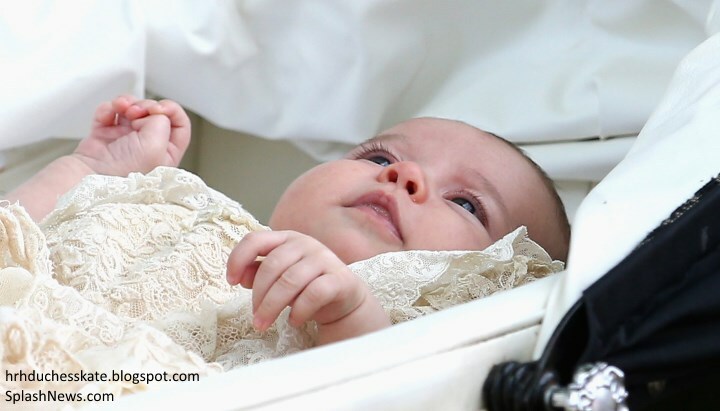 Princess Charlotte has beautiful eyes! She looks like a merry little soul, and very much in touch with her surroundings Interesting that her hair now is as dark as Mario Testino tinted it last summer - it wasn't then. Looks as if she has Kate's hair color without the curls. Prince George has William's hair color with Kate's curls. Otherwise, I can never decide who babies look like. They look like themselves for quite awhile! Oh Joy, what a lovely treat! I agree that there is a resemblance to grandmother Carol and great grandmother Queen Elizabeth II; however, I think that I see has the striking cornflower blue eyes of her grandmother Diana. But what an adorable baby girl; such a personality. Although we don't know her personally: with the personality displayed via the photo, it is no wonder that her Dad, Prince Williams describes her as a "joy from heaven"--we all know what a joyful feeling we have to hear and see laugher and smiles from a baby. What a beautiful blessing for her parents. Another poster mentioned hopes for another baby and maybe even twin as the Middletons' have twins on their side of the family- here's hoping the same for them-- they make beautiful children. Wishing them all the best and many Blessings. Charlotte: Thank you so very much for your wonderful work in putting together this blog. All the best to you and your family. What a wonderful treat!! I think she very much resembles her big brother except for her darker hair and light eyes. I do appreciate that they are releasing more relaxed photos and are not necessarily on a specific timeline. As a proud aunt to 4 beautiful children, I would love to see a photo of Prince Harry with the Prince & Princess. He appears to be a natural with kids and I'm sure even more so with his nephew and niece. I'm sure they'll release a photo of both beautiful children, if not the whole family, for Christmas. I love these glimpses we get of the family - so lovely! To Charlotte Admin -- I am glad you are ok. When I saw the photos on USA Today, I didn't take a second glance. I came to this site instead...but you hadn't posted. Oh no! Something must have happened to Charlotte. No. It is a Windsor Wingback Upholstered chair. Just google "photos Windsor Wingback UPHOLSTERED chairs". We have them for years and that's everyone I've known calls them. Nice mix of Windsor, a little French provincial and the nailhead (or hobnail) trim makes a nice combination for the chair. The green and cream very pretty. When I googled, I saw a lot of Windsor chairs with spokes, including one pair with wings, and a lot of upholstered wingback armchairs, which were never identified as Windsor. Never the twain did meet, except in one link to this thread! Can you provide a specific link that identifies an upholstered Windsor chair? I do like the green and cream checked upholstery. I don't like wood with the paint partly worn off. However fashionable it is, that looks shabby but not chic to me. I think she looks just like Kate. She has her dark blue eyes. The Duchess has green eyes. Prince William has blue eyes and his mother the late Princess Diana has cornflower blue eyes. The Duchess has Hazel eyes, that's why they look green sometimes. If her eyes were indeed green, there would be no possibility of George's brown eyes. I remember reading somewhere that the Queen Mother had violet eyes. So Charlotte' s eyes might be a match for hers. However, babies eyes change so much during the first year that she may not end up with this brillant blue color. Since there is so much discussion of eye colour, I thought people might appreciate this article from California. I'm certain there are brown eyed members of Kate's family so George could be brown-eyed even if Kate's are truly green. Oh, I believe. I gave the wrong link when Charlotte publshes. http://genetics.thetech.org/ask/ask126 This is more on topic but they both show what a complicated genetic muddle it is. And Erika is correct I believe, eye colour does seem to change somewhat as babies grow older. Exactly Julia. The way people know about eye genetics is the simpled down version which is how eyes generally inherit. But like with all genetics, if you go into deeper studies there are alot more variables in play. So the "school knowledge" I and many other pocess in this area is not the full truth and have been a source of many misunderstandings, I guess. I ADORE the people in this blog. Have you ever heard of any other site where the chat about a blue-eyed little girl and about her resemblances gave the way to such well informed scientific inputs? My parents both have very dark brown eyes and my sister and I both have light blue eyes. It's only possible because each set of my grandparents had one with blue eyes, one with brown. In simple terms, brown is dominant, so it's called B. Blue is recessive so it's called b. So, each of my parents had to be Bb. They had brown eyes, with the recessive blue gene. When they "combined" there were 4 possibilities of eye color for me. BB, Bb, Bb and bb. So, I had a 1 in 4 chance of having blue eyes. That's right 20:09. Thanks for the clarity. Do you know the probability of twins, genetically speaking, when the paternal grandparents are twins, like Valerie Middleton and her twin sister? Wow.. all I said is that she had blue eyes. My mistake. Jesus. Ladies, if the parents have dark eyes, they can have children with blue/green eyes. If the parents have green/blue eyes there is absolutely no possibility of biologycal children with dark eyes. Goodness! Looked at the eye colour link supplied here: 'hey' 'bey2' 'gey'! She is gorgeous! A Windsor through and through!! George looks more like the Middletons, but Charlotte is her father's girl!! Really?! I am totally on the contrary side. What makes you think that exctly? Oh my gosh. She, to me, looks SO much like the queen mother. It is like the queen mother is looking out through Charlotte's eyes. weirded me out that they look so much alike. I am gad I do not believe in reincarnation. whew. Just look into those eyes. (not to sound creepy or anything.) Charlotte is the queen mother's genetic calling card for sure. I noticed that also 02:37. It is quite startling, especially with the sereness displayed in the photo. There are a couple of photos of the queen mother as a child where their eyes are almost Identical. If I knew how to post those links I would. It is pretty amazing. Beautiful baby! ... and the thought that family Christmas pictures may be coming just made my evening! I have to agree with the many that believes she favors the Windsor side. I put pictures of the Queen and Queen Mum as babies next to the picture of Charlotte today and WOW.... She is definitely a Windsor! She looks just like the Queen Mum and like I said above, definitely has her daddy's eyes. Such beautiful pictures and babies! Such a treat to see the pictures today! You can see here http://willowdecor.blogspot.it/2009/03/swedish-style-country-homes.html what the scandinavian country stile is like. Yes Rebecca, you are right. My brother spent many years in Denmark and now he has at home a beautiful closet in unpainted wood (I think it's fir), I like it so much. Oh, Paola, I love the style / furniture. Bright, warm and welcoming. Do you mean a cedar-lined closet, Paola? They smell so fresh and keep out moths. Sure beats moth balls. Like a cedar chest, only a closet. A very beautiful little girl .She looks like her mother with her father's eyes.George looks like William with Catherine's eyes . What a combinations of the genes .The Nature is great ! How lovely to get these unexpected photos of Princess Charlotte. 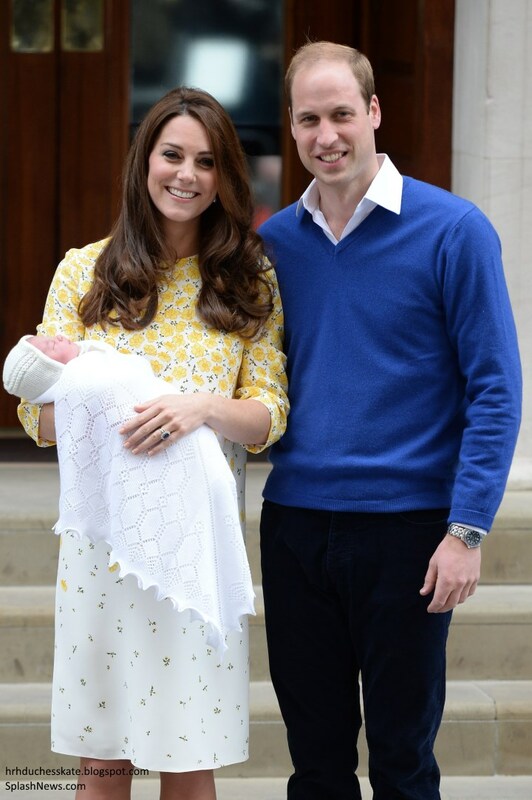 Like many of your readers I too am impressed with the lovely photos Kate has taken of George and Charlotte she is clearly a talented photographer and the photos are far more appealing than the christening ones which I was not at all impressed with and I thought they were very disappointing. I hope Kate continues to take and publish family photos as one will get a very much better idea of their characters from natural photos taken by their mother. Charlotte looks a happy contented child and in the more serious photo has a similar alert look to George but a much happier expression than George was showing at 6 months in the other one. I am glad she has dark hair as unfortunately if she had had blonde hair with her blue eyes she would have always been compared to Diana which would have been a shame. I must admit although I felt sorry for Diana I was never a fan of hers and I must admit I felt sorry for Kate being compared to her so often when she was first married but thankfully those comparisons are not happening as often now. I'm utterly hopeless when it comes to saying who babies look like - and never dare mention it even to friends for fear of offending someone. With such retorts from young mums such as - no her baby looks just like her gran - not her husband's side at all! And I notice someone will prove to be correct here as virtually every possible relative has been mentioned - it will be enormously fun to see who turns out to be the closest as Charlotte gets older - we should archive this post to see who has the most discerning eye. To me, there is a resemblance between Charlotte and George around the mouth - something about the expression. I don't think she much favours William when he was that age but who knows later on. With such good-looking parents, she seems likely to be blessed with good looks regardless. Don't forget Valerie and Queen Mary too - a wonderful variety. So basically she looks like all the family she is related too.....you are all cracking me up. Oops,Julia, you are right! I left them out :-) I like your archiving idea btw. I looked them all up and, to me, she still looks so much like the Queen Mum, especially the eyes. Just adorable photos and a lovely little girl. Kate clearly has a passion and talent for photography and I completely understand them releasing her photos. It protects the sanctity of their home, so to speak. While I'd like to see them cultivate relationships with the royal photographers for these events, I understand these more informal shots. I agree with you, Claudia. Royal photography has an outstanding history with some truly amazing photos. So far, William and Kate haven't been best served by it but we've seen some striking photos from other royal families. I hope they find a photographer who serves them well so we can have some true family snaps and perhaps someday something iconic like Beaton's coronation photo of the queen. Imagine if Philip, who thinks himself quite the photographer, had tried taking those photos instead. But for babies, mum perhaps captures them best as she can judge their temperament and mood best. I also agree with you on the press. But then I'm not a fan of Twitter and am bothered by international aspect of it. British should come first in my mind - but I am an old biddy. But for now, I'm just enjoying these lovely snaps of Charlotte. You are right, Twitter is an American company, founded in California. Why push traffic there? Isn't it better to promote the British papers? I've just been dumbfounded by this approach they're taking. If they want to release something through social media they could do that as an additional or supplemental thing, not as the primary source. Very odd, and does them no favors with the British press. I also thought the timing strange, but that's another discussion! I would like to see some official snaps (official doesn't mean formal) from a rotating hand of maybe 2/3 photographers, who they would built rapport and trust with over time. Ironic really, there have been so many photography buffs in this family - back to the Queen's own father and uncle - yet they don't understand the importance and difference of professional photography! Claudia, I agree with the benefit of giving the press one photo exclusively, but W&K haven't totally abandoned tradition. Mario Testino photographed Diana (and other royals) and they chose him for their engagement photos, etc. As far as the informal photos are concerned, I think you make an excellent point about it protecting the sanctity of their home. Yep, RF, those photos are definitely in the history pages now. And, good for them. The photos of the children and the work of the future Queen (consort) combined. I agree about protecting the sanctity of their homes, as much as I would LOVE a tour of each. I really have to disagree with you about them circumventing the media. They may have been released by twitter, but all the mews outlets carried the pictures. It actually allows them all equal access and shows no favoritism toward one source. Social media is the way of the future and they are embracing this way of communicating. It is direct communication to the people and takes out the "middle man" that will often skew the information. If the British press want favors, it might help if their photographers and royal writers cleaned up their acts. the announced future wife of a future king will be a long time fading into the distance. circles to diss the royals, but it is not very smart if one owes his livelihood to the royals. Do you think the chair could be something like that? It looks like a wingback with a modified arm. But without seeing the height and top shape of the back as well as the legs hard to know how much of a hybrid of styles it is. Could be an old piece redone and possibly restyled a bit or something brand new. I love to reuse family pieces even if it is typically pricier and more work than buying new. Ali Will look at the Windsor styles and see if it looks like that style as so many have suggested. She is the most BEAUTIFUL BABY!!! I am so glad they released those pics. How sweet of them! Oh my goodness-how adorable is she? photographing children while doing the photos for the catalog of her parent's Party Pieces business. That experience has paid of as she has the confidence to share her photos. That could be where her love of photography started. Queen Elizabeth was an avid amateur photographer also and may still be. I would love to see some photos of the children interacting with the Queen, Harry, Michael Middleton. I so loved the photos of Carole and George on the beach and also the one of W/K in dressy clothing bending down to speak to George during a tour break. I know the Queen might not be able to frolic with the "little monkey", but even a photo of them interacting at a play table would be sweet. Even Phillip could do that. Photos of George playing with Ilsa, Savanna and Mia would be nice. I am thankful for the photos we have been given thus far though. Prince George's eyes are variously printed as either dark brown or very dark hazel. His grandfather Michael Middleton has dark brown eyes. Pippa's eyes are darker than Kate's but not as dark as her father's. Princess Charlotte's blue eyes may well turn hazel as she grows older. That is what happens in my family. I wanted to put this message in the appropriate thread above, but I could not seem to get a reply box up there. So here it is, for whatever it is worth. Thank you for this post, I bought the corkswoon wedge and minx wedge right away from Nordstrom.com, they do price match! 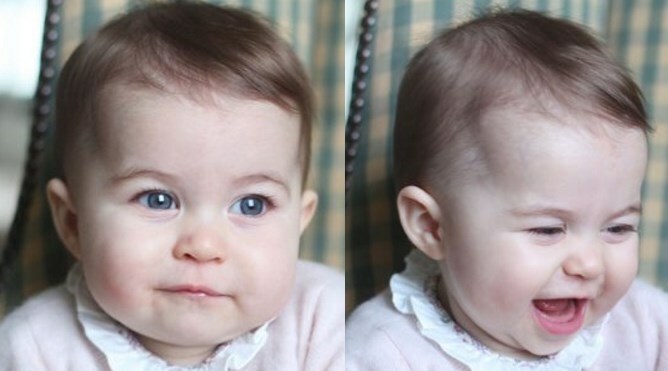 Princess Charlotte is adorable and these pictures are quite lovely. I am shocked by the timing of these pictures though. Prince Charles is currently in Paris discussing an issue that is probably the greatest threat to the survival of the human race and an issue that is his pet cause, and they chose to release the pictures of Charlotte on the same day as Charles' speech at such an important summit? Wow. If people here are constantly going to accuse Charles of trying to upstage the Cambridges, then they should not be hypocritical about recognizing the possibility of the opposite as well. I think Charlotte favors her father the most. For some reason there always seems to be a need to say little girls look like their mother and little boys like their father, perhaps people think you are saying the child is unattractive or feminine/masculine? I'm really not sure, but to me little Charlotte looks very much like her father, in an adorable, feminine way. All I see in this gorgeous baby's face s Carol Middleton - I don't get how people see the Queen or Queen Mother. Very smart of them to release some pics as Charlotte has not been seen in ages and demand will surely be building up. The dress is so very much in keeping with Liberty Print dresses. So so cute. Hopefully we will find out at some point. The photos are too cute. I've enjoyed reading everyone's take on who she looks like. On Friday night I was channel surfing & came across a documentary called Royal Babies that covers the generations from the Queen Mum to today. It was made just before the birth of Prince George. There were two main themes. The first was that the RF have shifted over time from a formal & distant parenting style to one that's more hands on. The expectation of all the commentators was that the Cambridges would be very hands-on parents which has proved to be true. The second theme was about the shift to more public lives for the RF. Until I watched this program I hadn't appreciated how much William & Harry grew up in the public spotlight with a constant media presence from when they were small babies. It was only after the death of Diana that there was the agreement with the media to give them some privacy. The consensus of the royal commentators & historians was that given his own very public childhood Prince William would be determined to protect his children & make sure they had some privacy. Some commenters here on the blog have been wondering whether the childhood photos of the Queen were published at the time or came later. My grandmother is the same age as the Queen so I asked her. She says that the Queen's childhood was in the pre-WW2 period when info & entertainment came in auditory not visual form. Families gathered around the radio to hear the news, listen to entertainment etc. You didn't so much see photos as hear them described in detail on the radio. Occasionally a photo would appear in a newspaper. Things changed a bit after the abdication of Edward VIII in 1936. There was a lot of controversy & many people felt he shouldn't have been forced to abdicate. So to raise the profile of George VI there were lots of features about his family on the radio, especially what the two princesses were doing, their pets etc. This made the family very popular & more photos were printed in the newspapers. Around this time more women's magazines started to become available & they also printed photos. The RF were also very much part of the war effort & there was a lot of coverage of what they were doing. The fact that they stayed in London during the bombings rather than retreat to the relative safety of the countryside made them immensely respected & even more popular. Everything changed after the war when TV came along & the public saw more of the Queen's children as they were growing up. My grandmother started making scrapbooks of the RF in 1932 when she was 6 years old. These really early scrapbooks mainly consist of grainy newspaper photos & the occasional commemorative souvenir. She really enjoyed reminiscing about this period & hopes other people find it interesting too. Charlotte she loves your posts & thinks you do an amazing job with the blog. So much oral history seems to go by the wayside these days. I am gathering information about family history for my family and I have so many questions that could have been so easily answered and incorporated Into our family history for accuracy and enrichment but no one thought to ask. What a heritage and treasure those scrapbooks are. She is precious! What a nice surprise to see photos today. I didn't know they price matched either. That is REALLY nice to know. Thanks. Charlotte is absolutely lovely. Great to see these photos of her; I particularly like the one in which she is facing the camera so we can see her properly. I think that she looks a little more like William did at that age than George did/does. She seems to resemble Kate as well. The photos probably make any woman feel broody, whatever their age!!! Yesterday i saw Charlotte's photo and tatatatammm, she is look like my dream baby :) So beatiful, clever looking, cute and sweet. A unique mixture of almost all the Middletons and Windsors. God bless her.. Does anyone know the name of the emerald and diamond necklace the Queen wore to the Malta banquet? The emeralds and diamonds on that are huge. The Queen looked so young and glowing at the banquet and said she cherished her years of being head of the Commonwealth and that she so appreciated the help of Prince Phillip and Charles. Camilla was fairly blinged out also. Is it my imagination, or is she looking younger and younger?